In 2008, DI Alex Drake (Keeley Hawes) is a police psychologist based in London who is planning to write a book about the criminal mind. She is intrigued when she is forwarded a batch of reports from a Manchester copper named Sam Tyler, who fell into a coma after a car accident and experienced what appears to be a vivid hallucination about going back in time to 1973. Drake is fascinated by the world that he apparently created in his own mind. So, when her own encounter with a gun-wielding criminal goes wrong and she is shot, when she wakes up in 1981 and almost immediately meets DCI Gene Hunt (Philip Glenister) and his constant sidekicks DS Ray Carling and DC Chris Skelton, she immediately knows what the game is and the rules are. 100% convinced she has created this world in her own mind after slipping into a coma like Sam's, Alex sets about trying to find out what it is she needs to do to wake up. Realising it is only a few weeks before the deaths of her parents in a car bombing incident, she convinces herself if she can save them, she can save herself. But Alex's situation is different, she's not getting any messages from the beyond like Sam was, and her hallucinations (about a clown) seem to be very different. So what is going on this time around? The notion of Life on Mars having a sequel/spin-off series, especially after its finale seemed to answer the outstanding questions (or at least given the viewer some very strong clues as to what was happening) from that series, always seemed a bit weird. When the premise was announced, the uneasiness settled in. Was it just going to be a cheap rehash of Life on Mars but in the 1980s rather than the 1970s and with a female lead instead of Sam? These fears seem justified by the first two episodes of the first season of Ashes to Ashes. Unlike the perpetually confused Sam, Alex Drake immediately cottons on to the 'game' and rather smugly thinks she knows an explanation for everything that is happening. It has to be said that a smug hero isn't the most likable of characters, and in these opening episodes Alex is very tedious. Also, the writers seem to have forgotten some of the basics of Gene's character, and he is uncharacteristically passive as the series opens and his new DI starts going a bit loopy. Luckily, things pick up a lot in the third episode after Alex has had the wind knocked out of her sails a few times and the mystery elements of the show kick in. We start to see less of a pastiche of Life on Mars and more of an intelligent evolution of the premise. The characters of Gene, Ray and Chris have moved on somewhat since the 1970s, presumably thanks to Sam's influence, and the 1980s' own issues start to be explored in an intelligent manner, from the shifting attitudes to sexuality to the music of the era and various characters' amazement at cutting-edge technology such as Space Invaders and Betamax. The arc story is also stronger than the two in Life on Mars, with Alex's attempts to avert her parents' deaths lead her to inserting herself into their lives and learning some secrets that perhaps were better left buried. The writers also rediscover Gene Hunt's voice around episode three, and the classic lines and the wince-inducing bull-in-a-china-shop approach to policing are soon front and centre, as they should be. There's also a highly amusing bit of sexual tension between the two characters as well. The remaining episodes are very strong, the music is excellent, the characters are developed nicely and the denouncement in the final two episodes is compelling. In particular, the rules of the game that Life on Mars laid down and Alex has been following seem to be shattered by the events in the final episode. What really is going on? With two seasons to go after this one it'll be a while before we find out, but after a very shaky start, Ashes to Ashes hints that the answer could be stranger but more interesting than we first thought. 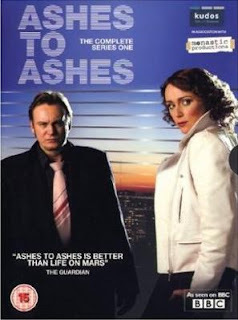 Ashes to Ashes, Season 1 (***½) takes a while to get going, but once it does it becomes a worthy continuation and successor to its parent series. It is available now on DVD in the UK. A US release is planned for 2010. Season 2 will be released on DVD in the UK in a couple of weeks.